Maou "Demon Queen, Dark Lady, Crimson Scholar"
The main female protagonist and the supreme ruler of the Demon Realm. 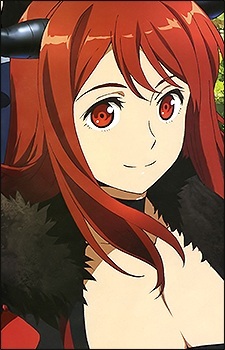 Soon after Demon Queen and the Hero join forces, she sets for the Human Realm, disguising herself as a human noblewoman known as the Crimson Scholar (紅の学士 Kurenai no Gakushi? ), and sharing a part of her vast knowledge with the Human society to help improve their civilization. Becoming famous in the Human World not only by her feats, but also by her beauty, the Crimson Scholar is viewed with distrust by the church who brands her as a heretic in spite of her growing influence, fearing it would loosen its grasp over the countries helped by her. To ensure a temporary ceasefire between the Humans and Demons, the Demon Queen disseminates rumors that her battle with the Hero indeed occurred, resulting in his disappearance and her body becoming severely wounded, thus leading her servants to the false belief that she would not be able to command them until her recuperation is completed.